If Prop 1 passes in November, Michiganders age 21 and over will be able to legally smoke and grow recreational marijuana. Cities that allow marijuana facilities will also share in new tax revenues. Those that don’t may still need to change ordinances and enforcement even though they won’t reap the financial benefits. Update Dec. 4: You can smoke pot in Michigan but not buy it. What you need to know. Two weeks ago, Grand Haven City Manager Pat McGinnis typed up an email to his fellow city managers across Michigan and sent it out on their shared listserv. The ask: Split the cost of hiring a law firm to guide them on how to comply with the new recreational marijuana law, if voters approve it in November. The response was overwhelming. Within four days, 60 local governments said they wanted in. Support for McGinnis’ plan is reflective of pervasive concern and confusion among local communities over what recreational marijuana would mean for their cities, according to more than half a dozen local leaders and experts who spoke with Bridge. Their worries run the gamut, but all mentioned concerns over how any new policy would be regulated and implemented, and how difficult it would be to change if it goes awry. Jennifer Rigterink, legislative associate at the Michigan Municipal League, said local governments have much to sort out. Their concerns vary from inconsistencies between the medical and recreational laws to implications for local zoning and law enforcement training. “I don’t think I’ve had anyone express excitement,” Rigterink said of conversations with local leaders. That’s a stark contrast with most Michiganders’ sentiment. Legalizing recreational marijuana is popular in the state — recent polls from the Detroit News and Detroit Free Press both found support for Prop 1 at 56 percent. Polling from earlier this year found support to be as high as 61 percent. But a recent survey by the University of Michigan Center for Local, State and Urban Policy (CLOSUP) found that those who lead Michigan’s local governments are far less enthusiastic: While a majority of Michiganders support legalization, only 21 percent of local officials do. And it’s not just conservative leaders who account for that gap. Nearly 70 percent of Democratic Michiganders support adult use legalization, while only 35 percent of Democratic local officials do. For Republicans, nearly 40 percent of voters approve but only 17 percent of local officials do. Local leaders’ concerns over regulation might sound familiar. The Republican-led Michigan Legislature attempted to preempt and pass the popular ballot measure in the spring ‒ not because GOP leaders favored it, but because it would have provided a chance to ensure stricter regulations than would be possible if the measure passes at the polls. But the Republican-led state house couldn’t rally the votes, so it headed to the ballot as-is. To amend it, legislators would need a three-quarters majority vote. Legalization proponents argue that the proposed law was written to fit in neatly with existing regulations for the state’s medical cannabis industry and to avoid the kind of complications that arose with the state’s medical marijuana legalization roll-out, which first became legal in 2008 but did not reach current regulation standards (the Medical Marihuana Facilities Licensing Act, or MMFLA) until 2016. Hovey said the fact that any legislative changes to the ballot measure would require a three-quarters majority is a good thing — it would require significant compromise between the two major state parties and ensure any changes actually improve the law. Multiple city leaders told Bridge, however, they think legislators missed an opportunity to iron out details with a simple majority had Lansing passed the law last spring. Local leaders say they worry that the regulatory framework eventually created for medical marijuana isn’t a perfect model for recreational pot, if it passes. A top concern, according to Rigterink of the Municipal League: Local governments have to opt-in for allowing medical marijuana dispensaries, but the opposite would be true if recreational pot is passed; local governments would have to opt-out if they don’t want weed stores in their towns. She said there would also be inconsistencies in the business application process for medical marijuana versus recreational pot, along with different definitions and licensing requirements. “Not being consistent between the two acts allows for confusion and other things to possibly happen when they’re regulating the same product, one medical and one recreational. But it’s still marijuana,” Rigterink said. Prop 1 would allow local governments to regulate where, when and how recreational pot facilities operate. But the ballot measure forbids towns from implementing rules considered so impractical that a “reasonably prudent” business person would not operate the marijuana business. Doug Mains, an attorney at law firm Honigman Miller Schwartz and Cohn who helped draft the petition language, said this part of the proposal would mostly be relevant for the state instead of local governments. Five other states have the same language in their law, he said, and only one lawsuit has ever been filed under it. "I don’t see it as being much of a concern for municipalities in practice,” Mains said. Some local leaders say they also worry about how they’d have to change zoning to accommodate businesses, train police to enforce new laws, develop methods for drug testing public employees and make sure laws are minimizing the risk that children will be exposed to pot. Advocates of Prop 1 estimate its passage would bring in $520 million in combined tax revenue over the first five years. But communities that don’t allow pot businesses will not receive a portion of that revenue — leaving leaders of smaller municipalities who do not expect their citizens to allow facilities feeling like they’d have to take on the burden of regulation and employee training (including law enforcement) without the revenue benefits. Ivacko of CLOSUP said this cost-benefit concern was perhaps one reason why only a small percentage of cities (8 percent) opted in to allow medical marijuana facilities. Many Michigan towns and cities are still struggling financially with few options for raising money. So when his group dove into its study of local governments’ attitudes toward pot, Ivacko expected local leaders to support medical marijuana as a possible new source of revenue. “But we didn't see much of that. Some local leaders said even if they were able to tap into a new revenue stream that just simply wasn't going to be enough to make it worth the troubles that they would get, whether it was the need to update their planning and zoning ordinances, to regulate businesses once they’ve opted in and to enforce laws around it,” Ivacko said. Even larger cities — which are more welcoming of medical marijuana facilities and may be open to recreational ones — share concerns. Grand Rapids may choose to allow recreational facilities should Prop 1 pass. However, it is one of the only communities in West Michigan interested. “What impact does that have on traffic for our business districts and then oversaturation of use in any particular business district?” Schulz of Grand Rapids asked. 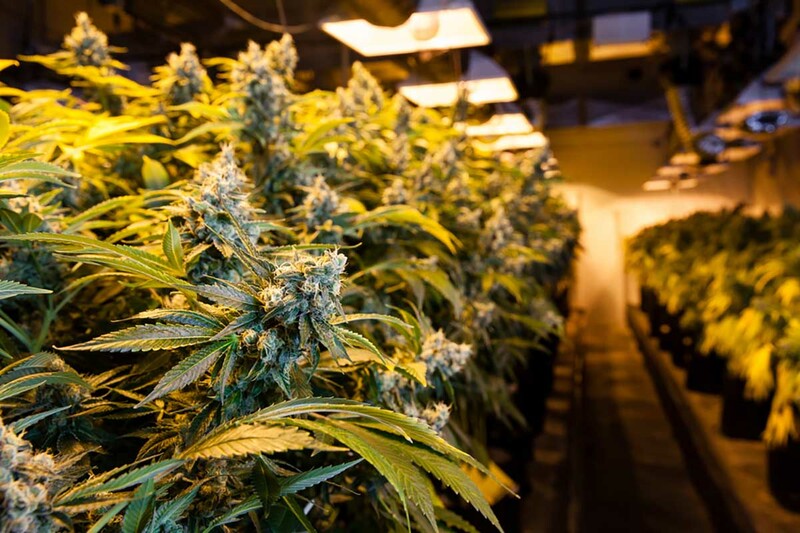 Grand Rapids’ city commissioners also want to make sure any marijuana policy takes into account that pot criminalization has historically resulted in disproportionate arrests within communities of color. “How can we think of the industry in a way that it could be beneficial to this community… to get at this really disparate impact on communities of color for marijuana policy, and trying to turn it into a benefit so that not only white wealthy people and corporations are benefiting from it,” Schulz said. The city is already exploring solutions for zoning and other regulations that could apply to medical and recreational marijuana, Schulz said. Some local officials see it as a business opportunity, while others see it as a burden. Marcus Peccia, Cadillac city manager, said a lot of communities, his included, are taking a “wait and see approach” to see whether Prop 1 passes and learn more about how medical marijuana regulation is panning out in other towns. Others, like Grand Haven’s Pat McGinnis and 60 other cities, are joining forces to prepare just in case. Hence, hiring the lawyers. Simply put, we appear to have a government that could care less about the will of the people. They are more concerned with keeping their phony baloney jobs than serving us. If they can't get a "harumph" at their meetings, somebody is gonna pay. As I understand this proposal, any community can if the people do not want to have a dispensary in their area can abstain from that dispensary operating. They also will not get full benefit from taxation revenues. There's nothing wrong with this. If a community such as Cadillac Michigan doesn't want a selling point yet Gaylord or Grayling does, customers simply will go there if they want to. Cadillac will also not be able to criminalize a citizen as long as they stay within the parameters of the law. There was an event a few months ago where IMO an overzealous law enforcement agent and agency "went after" an older citizen as her card had expired. What a community will not be able to do anymore is persecute people like that.